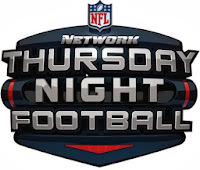 Using Pro Football Reference, I collected the result of all 148 games featuring a team that had played the previous Thursday dating back to 2006, when Thursday Night Football as we now know it first debuted. As a proxy for how that team was expected to perform, I recorded the Vegas line for each game, also from PFR. 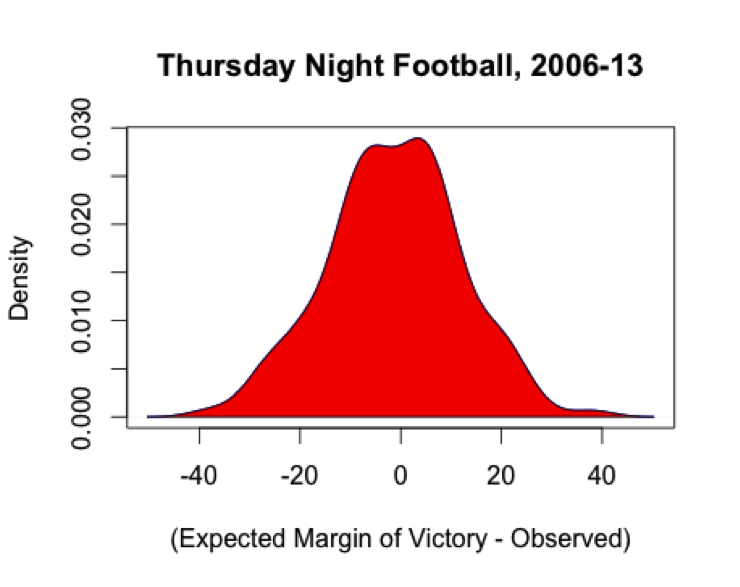 If no such Thursday effect exists, we would expect the average difference between the expected outcomes (the point spread) and the observed outcomes (the actual margin of victory/defeat) to hover right around zero. A quick glance at the density plot above suggests that there might be something to this hypothesis, as the distribution looks skewed ever so slightly to the right. The numbers underlying the graph back that up, showing that, on average, a team coming off a Thursday game actually beats the spread by 1.32 points. This is not an immaterial amount, especially considering that home field advantage is worth about 2.5 points, according to Jeff Sagarin. Put another way, we might say that a Thursday night game is worth an additional half-home game on the schedule (sort of). A t-test reveals that the overall post-Thursday advantage is not statistically significant (p-value = 0.22), but with a sample of only around 150 games, we shouldn’t take that to immediately render the analysis invalid (a mistake I made in a post on Thursday nights last year, this one with injury rates). Expanding the study to include more years might reveal that the effect is in fact quite robust, and our initial suspicions were accurate. I found another interesting item in the data when I broke down teams by whether their post-Thursday games were played at home or away. Assuming a uniform home field advantage factor is incorporated into the point spread, we would expect no difference in the performance of post-Thursday home and away teams in this sample against the spread. However, home teams enjoy an even larger post-Thursday advantage, beating the spread by an average of 2.24 points, as compared to 0.82 points for post-Thursday away teams. It could be the case that this difference would go away with a larger sample, which included 52 home games and 96 away games, but again, we’d need more information to get a clearer picture. 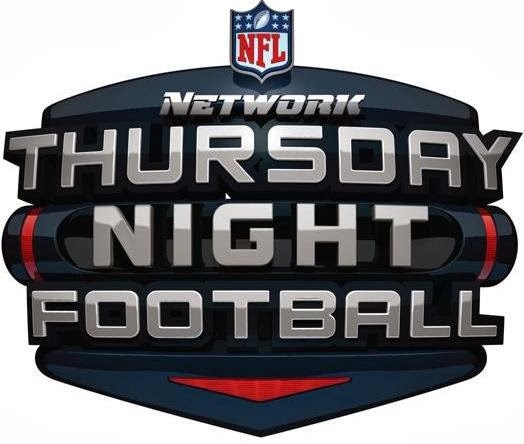 Obviously, NFL games were played on Thursdays well before 2006—the first Thanksgiving games were played in 1978—so this analysis could be bolstered by a larger sample of games, as alluded to before. I could also have used some other proxy for expected performance, such as the Simple Rating for a team and its opponent, to see whether my findings held up. In looking at the games I did have in my sample, I thought that the point spread might be an inadequate way of measuring relative team quality for the Week 2 post-Thursday teams—the ones coming off the season-opening Thursday night game. At that point, even Vegas doesn’t have enough information about teams yet; something tells me that, by Week 5, the Broncos would be favored by slightly more than 4.5 points over the Giants, as they were in Week 2. Finally, it’s possible Vegas has already taken note of this phenomenon and adjusted its spreads accordingly, but that doesn’t mesh with these results. Still, I am inclined to say that, in general, the extra days of rest following a Thursday game do afford a team some tangible advantage—though tread cautiously if you try to take advantage of your newfound knowledge in Week 6. Don’t blame me when the bank forecloses on your house; you bet on the Bills, and that’s asking for a lifetime of misfortune. 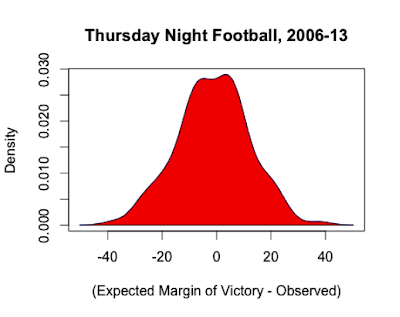 Did you look at whether monday night games are a disadvantage? For the Thursdsay Night game, Is the home field advantage more, or less, (or the same) as the normal home field advantage? In other words - does playing the Thursday night game increase or decrease your home field advantage? I think the more interesting question is not what happens AFTER Thursdays, but what happens ON Thursdays. Based on the anecdotal evidence that Thursday night games tend to be terrible, because both teams are lacking recovery and preparation time. See if penalties, miscues, turnovers, are up, overall yardage, points, etc are down compared to Sunday or Monday games. Trying to quantify what effect the shortened--not the lengthened--practice time has. Your entire analysis rests on the assumption that betting lines do not already factor in the benefit of additional rest/prep. time. This assumption is not a good one. The only thing your analysis measures is whether the market is adjusting enough to the situation. To do the analysis you had intended to do, you would have to use a blind power rating system to project each game without any knowledge of the rest/travel conditions. As the 4th Anonymous has said: all you've proved is that Vegas is quite good in incorporating the rest/rust factor in the lines. 4th anonymous and TRad are dead on correct. I'm confused. I thought the above provides some reasons for thinking Vegas is not 'quite good' at adjusting. And the fact that they are not provides evidence, albeit weak, that there may exist such a phenomenon. A much better way to analyze the Thursday effect would be to see how the team did in all their games (by looking at the strength of their opponents and the scoring in the game) and then how they did in their post-Thursday games. Of course, such analysis would have a lot of noise, since teams vary in strength over the season, and some of the terms above don't have obvious definitions. But it's a much better approach than assuming that oddsmakers and bettors don't consider any possible Thursday effect, which is what the above analysis does. Based on my data base (1996 -2012, weeks 4 to 16), teams with more days of rest won ATS 487 and lost 431.or 53%. 1.5 points over 150 games intuitively seem significant to me. I have not run a formal test(although I ball parked it mentally), but you can double check. I am thinking offhand that the standard deviation of absolute differences from the line is about 7 points. this sigma x bar would be 7/sqrt(150), which is a little more than 0.5. this makes 1.5 more than 2 standard deviations away from the mean, and hence a p value that should be less than 5%. I don't know, did I do something wrong here?